I can’t remember the last time I had a restaurant meal with half a dozen different elements on one plate, which took the same number of people to cook. This is not the kind of thing a food writer should say, but sometimes I wonder why we cook â€“ or want to eat â€“ anything complicated at all. Look at what’s around now. Broad beans. Pod them and, if they’re really young, eat them raw with cured ham or shaved pecorino and olive oil. Asparagus. Steam and dip the stalks in melted butter. Peas. Don’t even bother to pod them. Put a bowl on the table with some butter, sea salt and bread and have a feast. 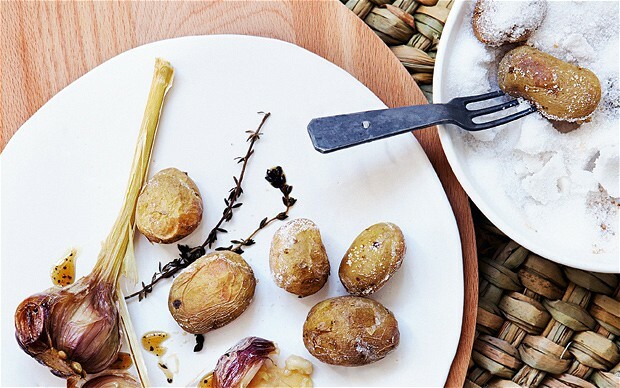 Some hot-smoked salmon would be lovely afterwards, maybe roast beetroot, and a plateful of one of the best things about a British spring: the French have their Ratte and Charlotte, but neither is a patch on Jersey Royals, early-season new potatoes grown on Jersey. All the seasonal greenery is great, but when I see the first boxes with jersey royals stamped on the side my heart skips a beat. To my mind they are not celebrated enough, probably because they are neither exotic nor foreign. They are potatoes â€“ everyday fare. But if they were four times the price we’d be whooping about them the way we do truffles. The best examples are produced by growers who also have dairy farms. The manure the animals provide, together with the use of vraic (seaweed gathered from the beach), is partly what gives the potatoes their special flavour. As with all the best ingredients, it is sacrilege to do much with them. In fact, to truly appreciate them you need to think outside the box. The first recipe, where they are baked in salt and served with roast garlic and crÃ¨me fraÃ®che, does not have to be a side dish. Up the quantities and enjoy it as a lunch dish in its own right with a green salad. Or eat with a crumbly English goat’s cheese and some radishes instead of the crÃ¨me fraÃ®che. Or make a range of flavoured mayonnaises â€“ a green herbal one, a saffron one, another with chopped capers and anchovies â€“ and eat your JRs with these and some hard-boiled hen’s or quail’s eggs. Jersey Royals are rich, sweet and waxy, and any fatty emollient (cream, mayonnaise, butter) only serves to heighten these characteristics. Perhaps it’s the Irish in me but a plateful of these little potatoes is my idea of culinary luxury.